AP D.Ed First Year Result 2019-2020 for 2017-19 batch : The BSE Andhra Pradesh will organize D.EI.Ed First Year Annual Examination in the Month of May. The Students can collect AP Ded Results 2019 for 1st year as soon as from here. All candidates may get board ded 1st year result & recounting details through online website bse.ap.gov.in. 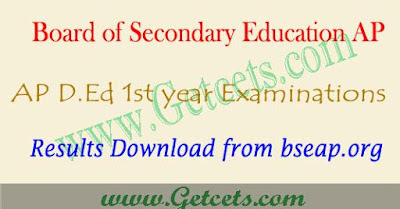 You can follow the given steps which is at bottom of this page regarding downloading AP Ded 1st year exam results 2019. Directorate of Government Examinations Andhra Pradesh @BSEAP is an independent department functioning under ministry of secondary education. The department is responsible for releasing time table, hall ticket and results and conducting the SSC/OSSC exams, Ded 1st year, 2nd year Examinations and a number of minor examinations and also will organize Advanced Supplementary Examinations. Earlier Director of government examinations(DGE) board has issued the D. Ed first year, 2017-2019 batch annual examination time table in the month of March and Board would be conducted examinations successfully as per given their schedule. These examinations were started from 9th May to 15th May 2019 by 09 AM to 12.00 Noon. Regular and failed candidates (old batch of students) had appeared for board exams.